June of 1960: Harold and Doris Stewart bought the Esso Service Station, on the corner of Big Creek Rd. and Ct.Rt.70A. They were open 7 days a wk. 7am - 7pm. Harold worked very hard 7 days a wk. Doris did all the paper work from home, as that was where the office was. At this time they were doing repair work,pumping gas and washing cars. There were no lifts and only cold water to wash cars. Gasoline was .29cents a gallon. By the end of 1960 they had to hire there first full time employee and 1 part time. As Doris stayed at home to raise the family. She would deliver Harolds lunch and dinner to him every day. When the boys got old enough to help They would work after school and on the weekends. 1966: Esso had become a Exxon station, and there was a gas war going on. At this time we had decieded it was time to close on Sundays. 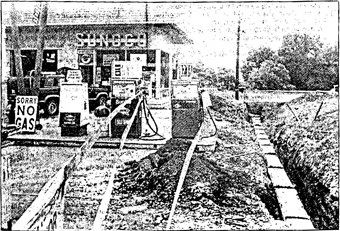 1974: We had bought the Sunoco Service Station, at are current location. 188 Seneca St. Hornell. At this time we took on 2 tow trucks and a indoor carwash. The tow trucks ran 24 hrs a day. Harold would work all day and sometimes all night, just to make sure that you got home safe. 1983: Scott, Harolds youngest son had graduated from the Alfred State college automotive program. In 1984 had gotten married to Debi Clark. He was working for his father part time,until graduation.Then went full time before purchasing the business in 1990. 1990: Scott, Harolds youngest son and his wife Debi had decied to purchase the Station. Alot of things were staring to change with the envermental laws. 1992: Scott had decided to remove the gas pumps and tanks. This was replaced by a three bay carwash and a new indoor automitic wash.
2000: Scott had started selling used cars. At this time we though this would fit in well with the Auto repairs, tow truck and car washes. It also allowed us to stop taking 24hr.towing. allowing more time with the family. Business hrs. went 7am to 5pm. 2002: We decied to build a new office at the shop. His wife started working full time with him at the shop. 2005: Scotts oldest son Brian had come to work full time with us. Youngest son Jason was off to college at Clarkson University. 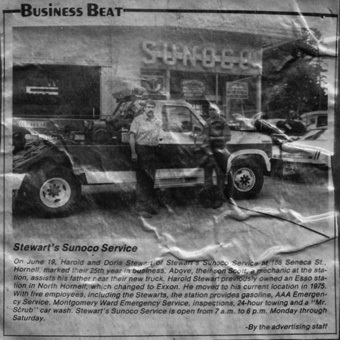 Harold Stewart has helped out a lot of people in the seven years he has owned Stewart's Sunoco, partially because of the 24-hour towing service he offers. Stewart, who purchased the Seneca Street station from the Ames family, never knows when a call will come in asking him to go out and jump start a dead battery, assist police with an accident, or just help a stranded traveler. "You have to respond quickly, especially when the calls come in the early morning," Stewart said. "Some nights I only get a couple hours of sleep and at times it throws your schedule off, but you get used to it," he added. Stewart, however, enjoys his work because it gives him a chance to be around people. "You meet all kinds of people; it's kinda different, kinda nice," he said. He believes it's important to "live and let live," and said "you just have to put one foot in front of the other." A bowler, Stewart enjoys fishing and "tinkering around in woodworking." Stewart, 56, and his wife Doris live at 186 Hornell Street. They have five children. On June 19, Harold and Doris Stewart of Stewart's Sunoco Service at 188 Seneca Street, Hornell, marked their 25th year in business. Above, their son Scott, a mechanic at the station, assists his father near their new truck. Harold Stewart previously owned an Esso station in North Hornell, which changed to Exxon. He moved to his current location in 1975. With five employees, including the Stewarts, the station provides gasoline, AAA Emergency Service, Montgomery Ward Emergency Service, inspections, 24-hour towing and a "Mr. Scrub" car wash. Stewart's Sunoco Service is open from 7 a.m. to 6 p.m. Monday through Saturday. "DEC regulations force change from gas pumps to a car wash"
Hornell – One of the city's last independently owned gas stations is getting out of the pumping business, a casualty of the growing cost of compliance with environmental regulations. 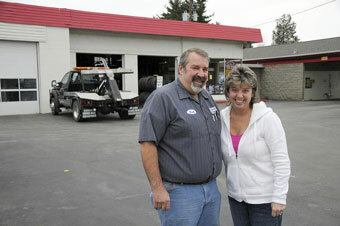 But Debi and Scott Stewart, owners of Stewart's Sunoco Service, 188 Seneca Street, aren't leaving the station. They're just changing its purpose. A mound of dirt marks the spot where three gas tanks used to be. The tanks were dug up last week, and the Stewarts will have built three self-service car washing bays by the end of summer to take their place. The station will continue to house an automatic car wash. The Stewarts will also continue providing a 24-hour towing service, plus car mechanical service in the main service bay facing Seneca Street. But no more gas. "I don't have the funds," Scott Stewart said in a discussion about environmental regulations governing the maintenance of underground tanks. According to Stewart, the state Department of Environmental Conservation has issued regulations mandating that gas stations carry $1-million insurance policies on underground tanks. In addition, the DEC ordered regular testing of the tanks in an effort to prevent underground leakage and contamination of ground water. The tests cost about $400 per tank, Stewart said. The bigger problem is that insurers won't insure tanks that are 18-years-old, as his were. Estimated cost of three new tanks: $64,000. "It's not feasible," Stewart said, noting his station's profit on a gallon of gasoline is about 3 cents. The threat of pollution, at least in this case, appears to have been over-estimated. According to Debi Stewart, when the three tanks were removed last week, there was no sign of leaks or contamination. The last vestige of the pumping business will be removed this week when the oil company shows up to remove the pumps themselves. In the meantime, footers have been poured for the car wash foundations, and the Stewart are anticipating setting up vacuum cleaner stations where the pumps used to be. "Stewart's pass on the business to son"
Doris Stewart looks on as her husband Harold congratulates their son Scott on taking over Stewart's Sunoco. Debi Stewart, right, Scott's wife also will be involved in the venture. Hornell – Thirty years ago, after having worked for Foster and Wheeler and the Hornell Brewery, Harold Stewart, along with his wife Doris, decided to open a service station, and the rest is history. As o Nov. 1, Scott Stewart took over the family business so his parents could retire after holding the reins for 30 years. It all began on June 19, 1960, when Stewart's Esso opened on the corner of Big Creek and Seneca Roads. The building was leased by the family. According to Doris Stewart, "It was open from 7 a.m. to 9 p.m. seven days a week. Harold put in some long hours to get the business going." In 1975, the couple purchased the present business, located on Seneca Street, from Bud and Ira Ames. "We liked the old location but this was a chance for us to own a business instead of leasing one," Harold said. When the couple purchased the Seneca Street location, they also took on their 24-hours a day," said Doris. The business, now known as Stewart's Sunoco, is open six days a week "because of the gas shortage" and closed most holidays, "but we're always on call," Harold said. In 1978, the couple added on a car wash to the business where patrons can get their vehicles washed and waxed. "We really haven't made that many other changes but we've stayed in business and had loyal patrons," said Doris. The fact that the couple has managed to stay in business is a feat in itself when you consider the fact they are the only family-owned service station in the city. "We are the only independently owned full-service station in the city now. All the others have gone out of business," Scott Stewart said. Scott, who Harold said "cut his teeth on a gas knob" started working part-time at the station while he was still in high school. He graduated from high school in 1981, and then he attended Alfred State College at the Wellsville campus and graduated in 1983 from the auto mechanics curriculum. Since then he has worked fulltime at the station. "Our other children all went their own ways. Richard, Martin, Cindy, and Julie all followed their own path. Scott always was involved in the business and we are very confident about putting him in charge," Doris said. The fact that the business is still owned by the family gives the Stewarts a feeling of pride, since so many other businesses have fallen by the wayside. When asked what the secret was Harold said, "I had a good bookkeeper. The most unsuccessful businessmen are those who don't know how the business is doing financially, Doris always kept the books and kept me up to date on the business." Scott's wife, Debi, will be following in the shoes of Doris and will be keeping the books for the business. Harold told a few amusing stories of events that has happened over the years. "One night a young lady came in and told us her dome light wasn't working. She wanted to know if we had any batteries for it," he laughed. But his favorite story is about the night that "Dolly Parton borrowed my bedpan. She was at the Angelica Fair and they stopped at the Big Elms to eat. The air conditioner had quit on her bus so the mechanic came to the garage and borrowed our radiator pan (which they call a bedpan) to drain it." On a more serious note, Doris said the couple were grateful for all the patrons they've had in the 30 years of business and "we would like those same people to support Scott as well." "Milestone for Stewart's in Hornell - 50 years on Seneca Streetl and going strong"
From Stewart's Sunoco to now, Stewart's Service has been a main stay in the community for the last 50 years. "I think it's quite an accomplishment for a business to be able to do that," Scott Stewart said. "It's been harder and harder staying in business over the years." The name may have changed, but the business has always stayed in the family. Twenty years ago, Nov. 1, 1990, Scott and his wife Debi took over the business from Scott's parents, Harold and Doris Stewart. After being open for half a century, the business has undergone several changes. In 1960, Harold and Doris bought the Esso Service Station on the corner of Big Creek Road and Seneca Street. In 1966, it became an Exxon station. 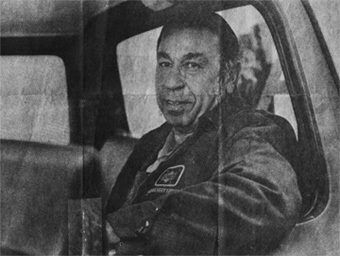 In 1974, the business moved to its current location at 188 Seneca Street and began offering a towing service. 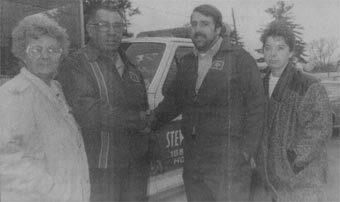 In 1990, Stewart's removed its gas pumps and replaced them with three carwash bays. In 2000, Stewart's began selling used vehicles. "It's changed tremendously since we opened," Scott said. Debi said state regulations have made it difficult for Stewart's to stay open, but the business has remained a constant fixture on Seneca Street. "It hasn't been easy," Scott said in agreement. "There's been good times, and there's been really bad times. We never had to lay off our employees." What keeps the Stewarts going? The customers, they said. "I had this guy come in yesterday and he remembered the day my dad opened up," Scott said. "He's been with us all these years. We have a very good following. We appreciate all our loyal customers." Alignments, batteries, brakes, exhaust systems, state inspections, and oil changes, Stewart's is truly a service station. With AAA towing, used-car sales and carwash bays, Stewart's is a one-stop center for all auto-related business. What's the future hold for Stewart's? In the short term the business is jumping onto the information super highway and launching a website soon. In the long term, the Stewarts aren't sure. Their infant grandson was playing around at the station, and they jokingly suggested he might take over Stewart's someday. "You never know," Debi laughed.